Where Does Technology Go Next? Should we worry about the predominance of technology in the benchmarks? 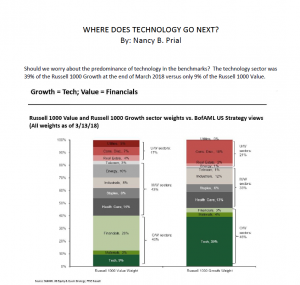 The technology sector was 39% of the Russell 1000 Growth at the end of March 2018 versus only 9% of the Russell 1000 Value. However, despite the strong performance of technology in general and the dominance of the FAANG themes in many growth investors’ portfolios, we believe that there is…..